Rejuvenate Oil dramatically rehydrates and rejuvenates your skin with a combination of botanical oils that are loaded with essential fatty acids, vitamins, antioxidants, phytonutrients and anti-inflammatories. Apply this restorative oil before going to bed and wake to revived, healthier looking and feeling skin. 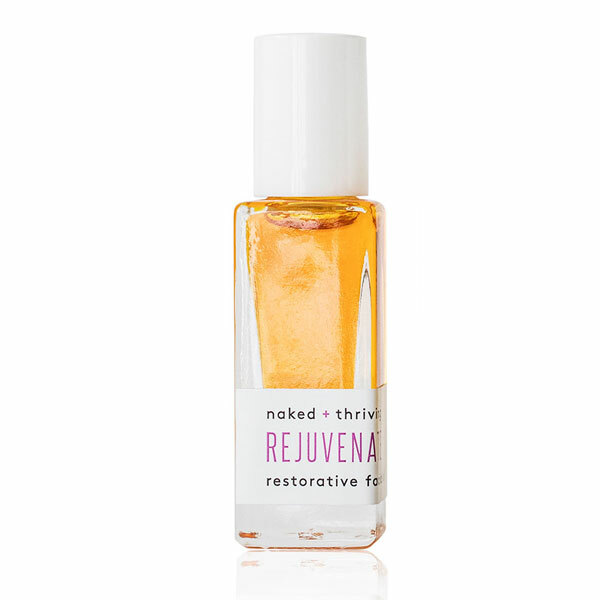 Rejuvenate Oil is formulated with gentle botanicals and is suited for most skin types. Can I use on Rejuvenate Oil on oily skin? Absolutely. When we over-wash and/or do not thoroughly moisturize our skin, it reacts by overproducing oil and sebum that leads to clogged pores and oily skin. These plant oils hydrate skin without clogging pores so that skin can cease production of excess oil. Rejuvenate Oil may take slightly longer to absorb into oilier skin types. Usage Tips: Dispense 4-7 drops onto fingertips and rub together lightly. Gently press Rejuvenate Oil onto clean face and neck distributing evenly. If your skin needs more moisture, repeat. Allow the restorative oil to absorb for 3-5 minutes before applying further products. Argan Oil: Often called “liquid gold” this precious oil has been used for centuries for its anti-aging properties. Rich in antioxidants and fatty acids that help restore skin’s youthful elasticity. Natural vitamin A & E reduce the appearance of wrinkles. Sea Buckthorn: This oil is the richest natural source of Beta Carotene, a form of vitamin A, that penetrates deeply into skin to restores skin’s natural beauty and revitalize from within. Chia Seed: Rich in omega-3 & omega-6 fatty acids as well as phytonutrients & antioxidants that protect and nourish cells. A powerful source of Alpha Lipoic Acid that decreases the appearance of fine lines and inflammation while enhancing skin’s natural radiance and glow. Rosehip Oil: Contains high levels of essential fatty acids Omega 3, 6, and 9 which help promote healthy skin cells and repair damaged tissue. From the fruit of the wild rose plant, this oil is naturally rich in trans-retinoic acid which aids in preventing premature aging. My skin is very sensitive and I do have rosacea. I can not promise the same effects on everyone with rosacea but my skin is hydrated. This oil is not thick or sticky. It absorbs well into my skin. Love it! Very nice face oil. Not greasy and absorbs quickly. I love this product! I use it every night and it soothes and refreshes my 66 year old face.